<a> tag specifies hyperlink and that is used to link the pages from one page to another. The "href" attribute is the most important attribute for the <a> tag, which is used to declare the page link goes to. The anchor tag supports the Global and Event attribute. An unvisited links are indicated blue color with underlined. A visited links are indicated purple color with underlined. An active links are indicated red color with underlined. 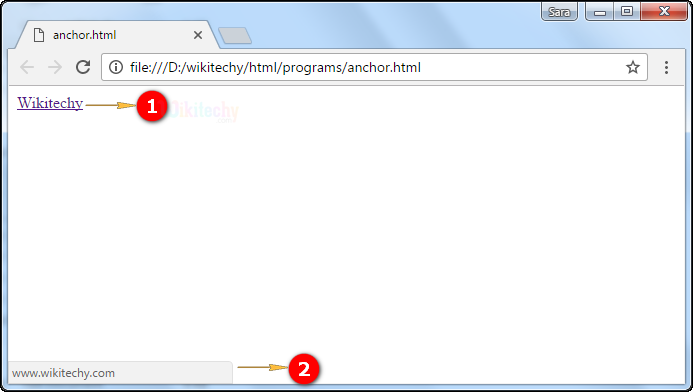 An <a> tag could be either an anchor or a hyperlink. An <a> tag always a hyperlink. If there is no href attribute then it can only be a placeholder for a hyperlink. The anchor element used to representing the hyperlink. "href" attribute is used to define the url path (or) link. "http://www.wikitechy.com" is global link to the wikitechy website. Here the output shows the term "Wikitechy" that has been hyper linked which will navigate to wikitechy.com. 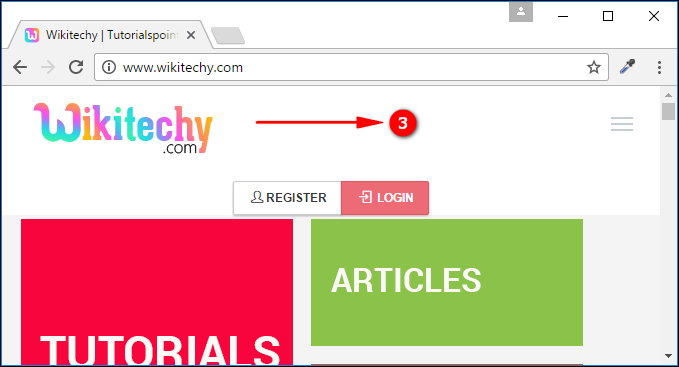 Here we can see the navigation of www.wikitechy.com which is being loaded in the browser window as. When user click the wikitechy that navigate to www.wikitechy.com website. value number Yes Yes Specifies the value of a list item. charset char_encoding Yes No Specifies the character-set of a linked document. coords coordinates Yes No Specifies the coordinates of a link. download filename No Yes Specifies that the target will be downloaded when a user clicks on the hyperlink. href URL Yes Yes Specifies the URL of the page the link goes to. hreflang language_code Yes Yes Specifies the language of the linked document. media media_query No Yes Specifies what media/device the linked document is optimized for. name section_name Yes No Specifies the name of an anchor. tag Yes Yes Specifies the relationship between the current document and the linked document. rev text Yes No Specifies the relationship between the linked document and the current document. poly Yes No Specifies the shape of a link. framename Yes Yes Specifies where to open the linked document. type media_type Yes Yes Specifies the media type of the linked document. If href attribute is not present. The attributes hreflang, media, download, target, type and rel can’t be present.